The fighter was injured in an attack that is under investigation by the Honolulu Police Department as a felony domestic violence incident. 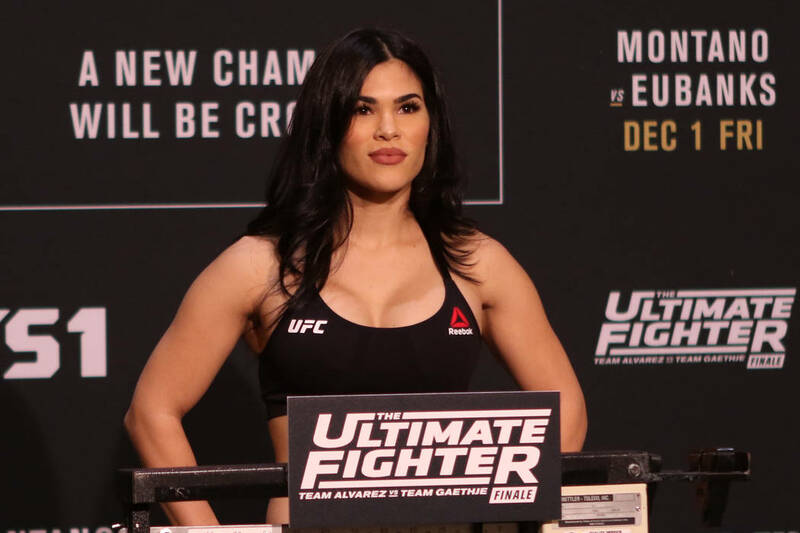 UFC fighter Rachael Ostovich was hospitalized over the weekend after an attack in her hometown of Honolulu left her with a broken orbital bone and other injuries. ESPN reported Monday the 27-year-old had been released from the hospital. UFC officials declined comment as they gather information about the incident. Ostovich is scheduled to face flyweight star Paige VanZant on the organization’s first card on ESPN-Plus on Jan. 19 at Barclays Center in Brooklyn. She was ruled out for the bout, her manager tweeted Monday night. According to TMZ, which first reported the story, the Honolulu Police Department has opened a felony domestic violence investigation. Ostovich competed on Season 26 of “The Ultimate Fighter” and earned her first UFC victory on the live finale card in December 2017 when she submitted Karine Gevorgyan in the first round. She was submitted by Montana de la Rosa in July to even her UFC record at 1-1. The Nevada Athletic Commission had an eventful meeting last week in Las Vegas. NAC officials voted unanimously to issue temporary suspensions to Dillon Danis, Zubaira Tukhugov and Abubakar Nurmagomedov for their roles in the melee following UFC 229 at T-Mobile Arena in October. All three will face full disciplinary hearings at a later date. UFC bantamweight standout Sean O’Malley accepted a six-month suspension for failing an out-of-competition test in September. He is still awaiting a sanction from the U.S. Anti-Doping Agency for the same offense. 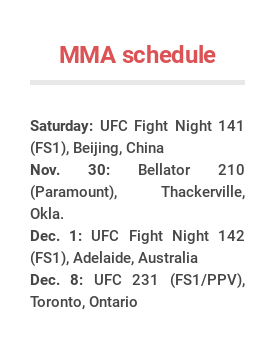 O’Malley was pulled from a scheduled bout against Jose Quinonez on the UFC 229 card as a result of the failed test. Former UFC fighter Cody McKenzie was banned from competition for four years for allegedly trying to submit a fake urine sample to an NAC representative on the night of a scheduled fight on a Tuff-N-Uff card at The Orleans on Sept. 14. McKenzie, an eccentric personality, says he was planning to retire after his scheduled fight that night and has challenged the commission’s account of the interaction in published reports. The UFC’s first Australian champion will make his first title defense in his home country. Robert Whittaker will put his belt on the line against Kelvin Gastelum in the main event of UFC 234 in Melbourne on Feb. 10, the organization announced. The event will air on Feb. 9 in the United States. Gastelum and Whittaker are serving as opposing coaches on Season 28 of “The Ultimate Fighter,” which airs Wednesday nights on Fox Sports 1. A split-decision win over Ronaldo “Jacare” Souza in May sealed Gastelum’s spot as top contender. Former UFC stars Chuck Liddell and Tito Ortiz are scheduled to fight each other for the third time in the main event of a Golden Boy MMA pay-per-view card at The Forum in Inglewood, California, on Saturday night. The cost is $39.99, but the promotion has announced it will sell the event for half price to those who purchase the broadcast between 1 and 3 p.m. PST Friday through the FITE TV website or mobile app. Liddell, 48, knocked out Ortiz, 43, in UFC fights in 2004 and 2006.